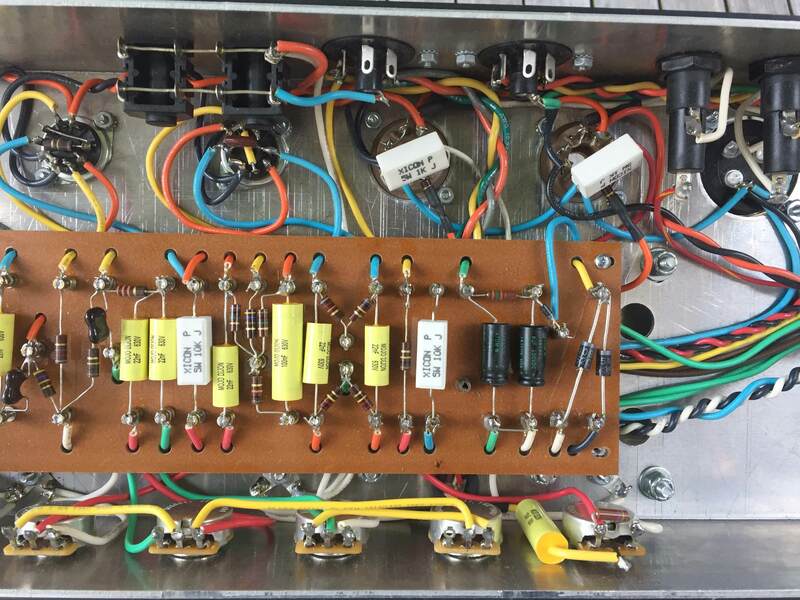 I built a 50w JCM800. Having issues finishing it, it is CRAZY dynamic. Without tubes, the voltages and on pins 1 and 6 of both V1 and V2 are very high, around 461-469v. I'm getting 519v out of the rectifier. This is way too high, right? 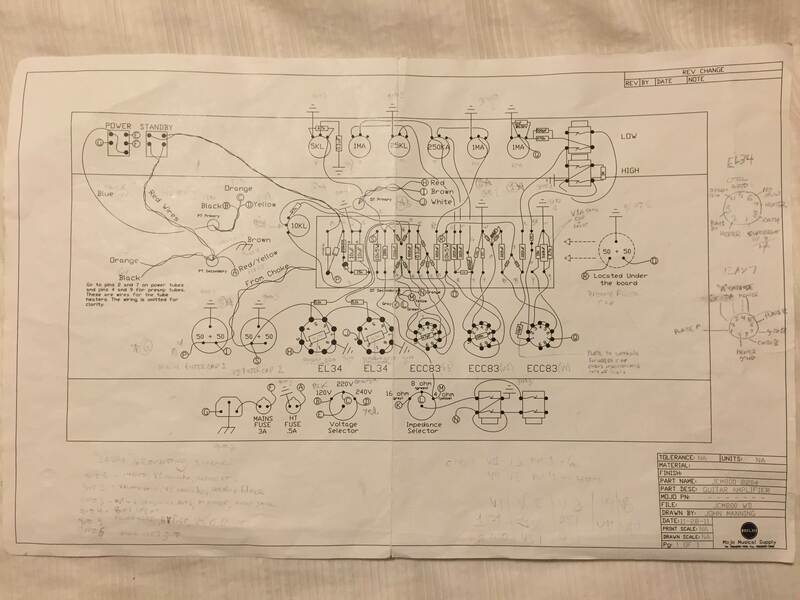 From mhuss's voltage chart for the 2204 i should be closer to 300v on V1 pin 1 and 245v on V1 pin 6.
my best guess was that the big 10k resistor on the B+ line before V1 had failed open but I measured it in circuit and it doesn't seem fully open or anything. Could it maybe be that the preamp filter cap has failed open and is letting big voltage past that resistor? it's under the board and i'll have to really tear things apart to get to it. Any help on places to look would be really appreciated! 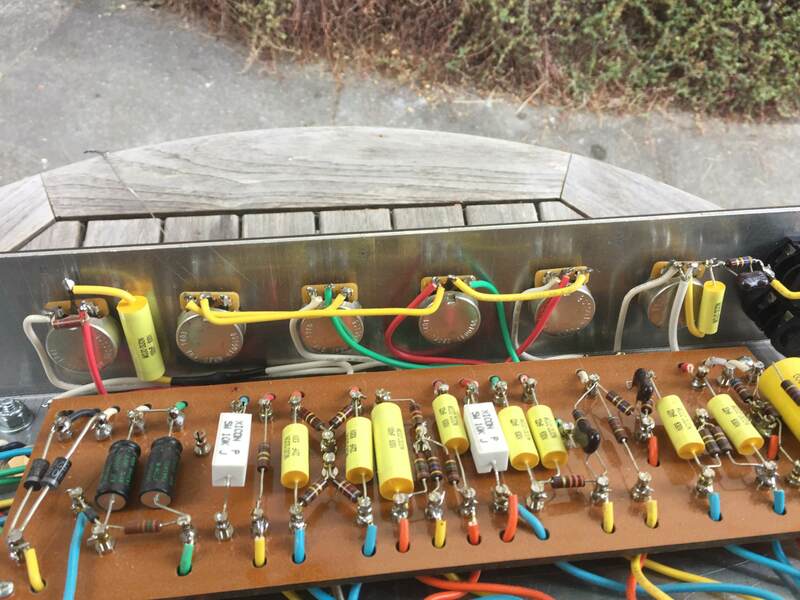 The V1-V3 plate voltages are more reasonable if i have the preamp tubes in and the power tubes NOT in. 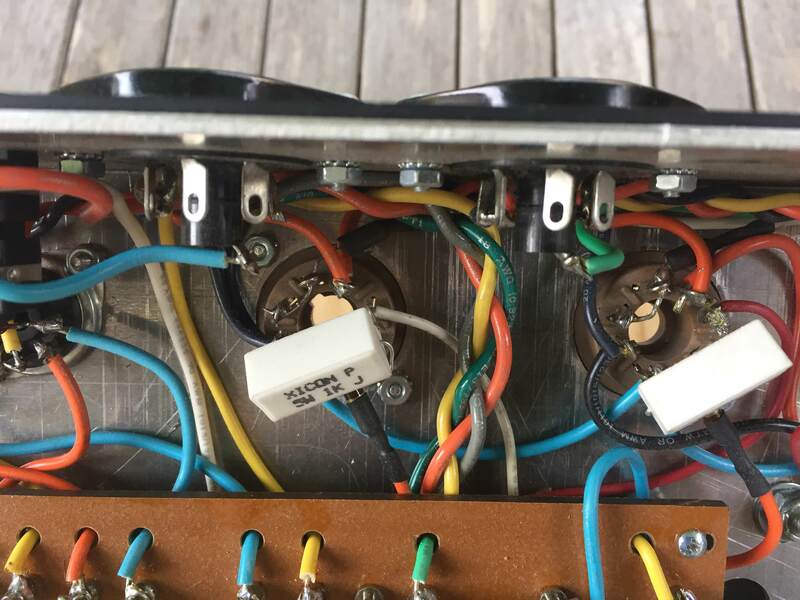 However, if i put in the power tubes, voltage at the V1 plate starts rising and rising as the power amp tubes heat up until it gets close to 500v and i chicken out and turn off the amp. what does this mean? 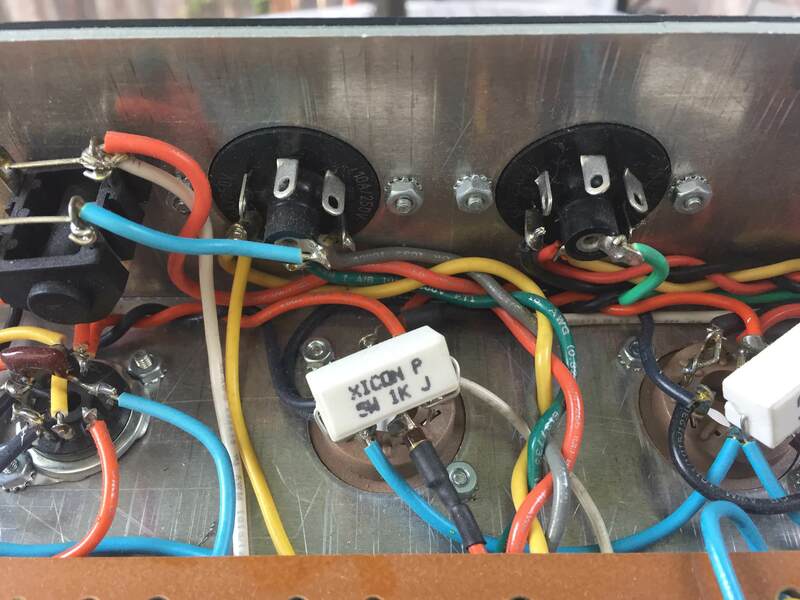 do i have a blown power amp tube or is it something more serious? 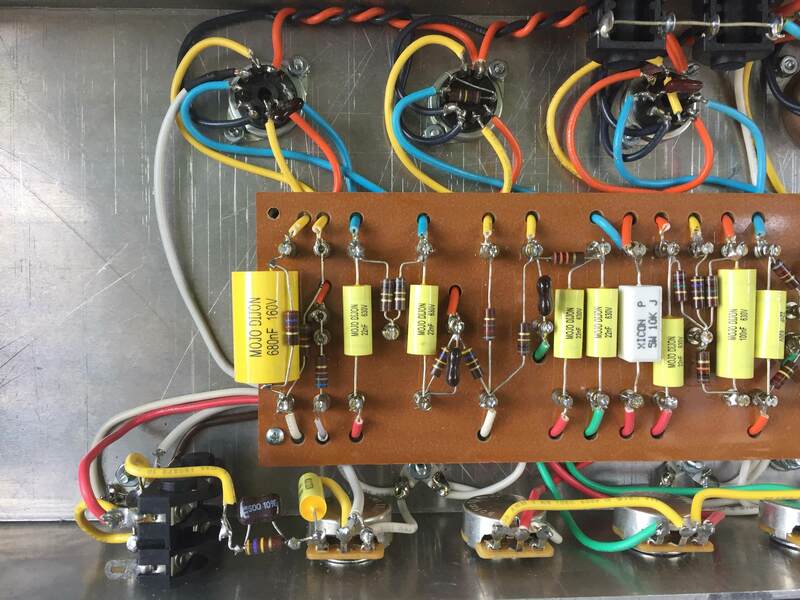 Without tubes in an amp, there is no load to draw current from the power supply. Because of this, the voltage from the 1st filter cap all the way to the end at the plates of v1 will be the same and be very high. Usually around 500v. With no load on the power supply, the 10k dropping resistors are basically doing nothing and the voltage just passes right through them. Now, when you load tubes and they begin to draw current, the voltages in the amp come down to normal range. 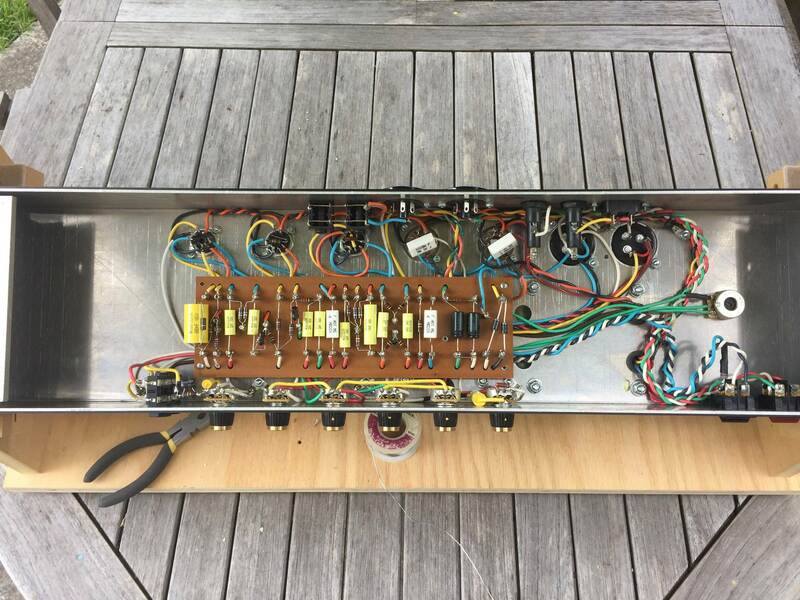 Preamp tubes are a small load so the voltage drop will be small. Power tubes draw the most current so the b+ will drop quite a bit when they are installed. If you bias the amp hotter for more current draw, the b+ falls. If you bias the amp colder, the b+ goes up a bit. 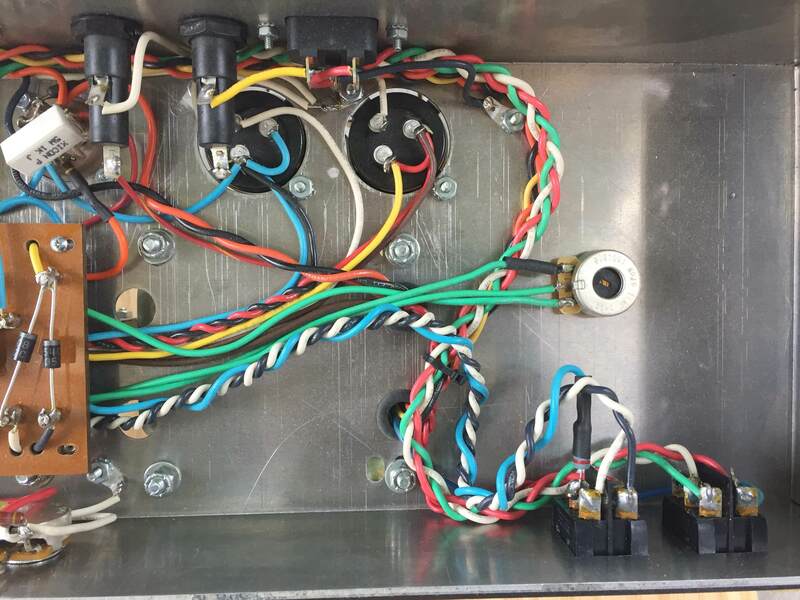 I would hook your meter to the first filter cap or pin 3 of one power tube and power up the amp with all tubes installed. Voltage will shoot high for a few seconds but as the tubes begin to warm up and draw current, the b+ voltage will begin to settle down to normal. 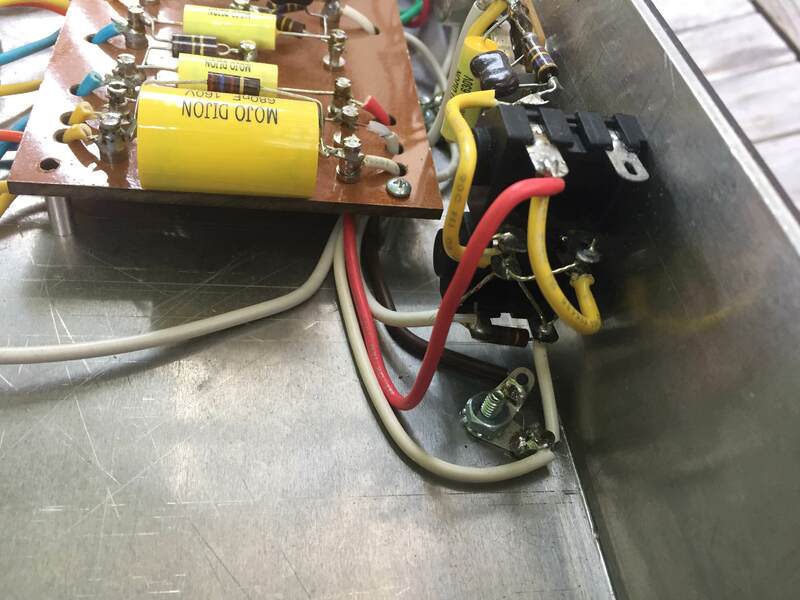 This is why you must use 450-500v filter caps throughout the entire amp because voltage does go very high until tubes warm up and begin conducting. It would be wise to set the bias pot for the highest negative dc voltage you can dial up before doing this though. Clip your meter to pin 5 of a power tube socket and set your meter for the lowest dc voltage scale (or use an auto ranging meter). Now with the amp powered up and no tubes installed, turn the bias pot until you see the highest negative voltage, maybe -50vdc or so. This will bias the power tubes very cold but will prevent redplating. 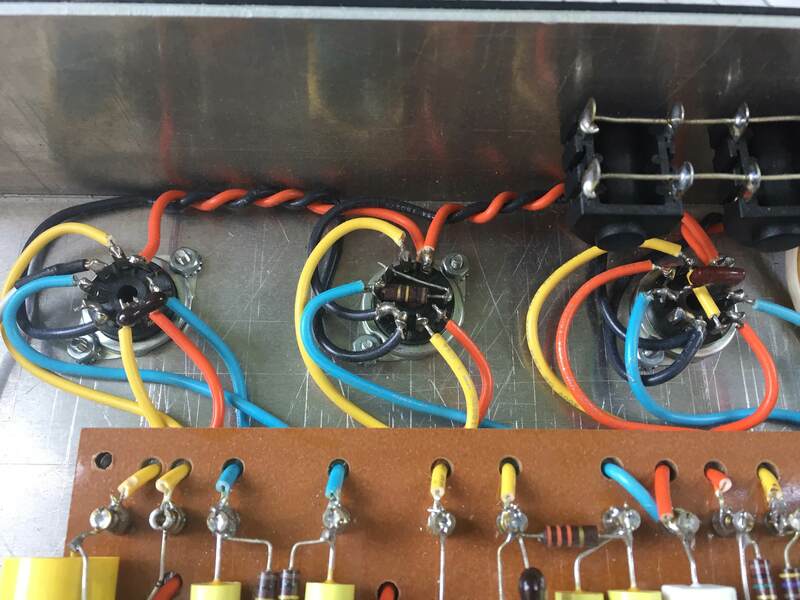 Now you can start the amp with all tubes and do your voltage testing. Remember that voltages will still look slightly high because the amp is biased cold. If everything looks normal, you can now do the math and use a bias probe or 1 ohm cathode resistors to set you bias. The b+ will now drop a bit throughout the entire amp as you warm up the bias. Thanks for your help! I took a bunch of readings today with tubes in, I will post those below with links to a bunch of pictures. I'm using a 1x12 cabinet with a 200w EV in it as a load while testing. With tubes out the amp voltages might be up 10% or so but if the B+ is that high you are always going to have issues. What mains transformer tap are you using for your wall voltage? Yours are reading 6.6v which is 5% over and if you apply this to B+ you are about right. 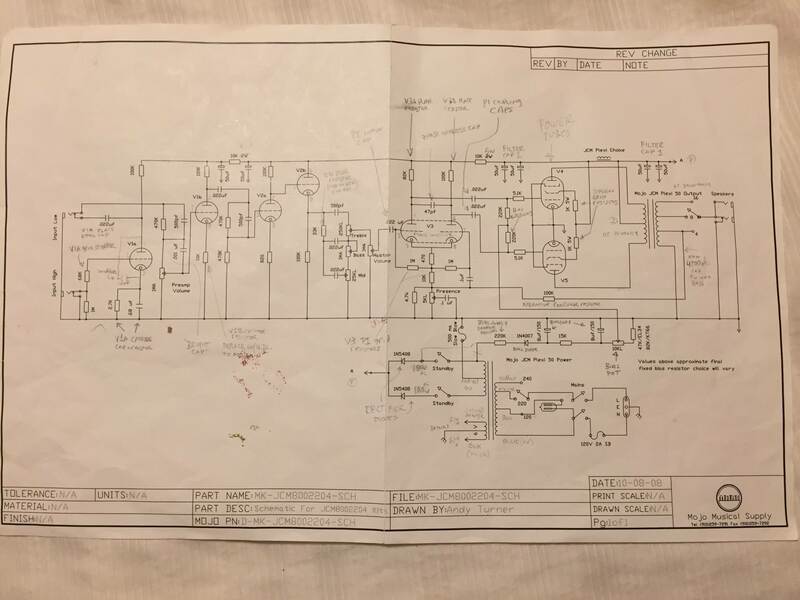 Maybe your wall voltage is too high - will a variac help?